In my work with students with disabilities, I have often used stories about real kids facing real challenges. I especially like the picture book format because this genre gets to the heart of a story so quickly and eloquently. When these books follow a narrative structure, I have the opportunity to talk about plot and story form as well as themes of perseverance and hope. 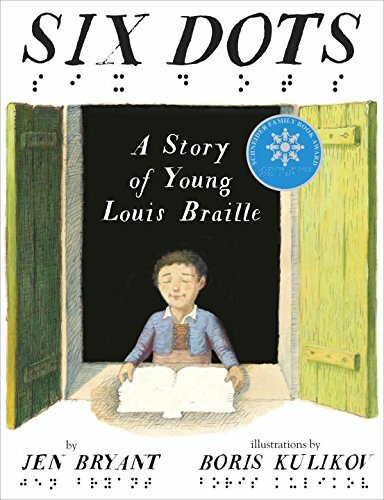 Six Dots: The Story of Young Louis Braille by Jen Bryant illustrated by Boris Kulikov (2016) Random House; New York. Grades K-4. SUMMARY: Louis Braille wants to read but there are no books for blind children in his small French village. He attends the Royal Academy for the Blind in Paris and is excited when he is presented with a book with raised letters, but the words are the size of his hand and the books are huge which limits the volumes the library can contain. He makes it his mission to produce a reading and writing format for the visually impaired and realizes his dream at the age of fifteen when he creates a system using six dots to represent all the letters of the alphabet. 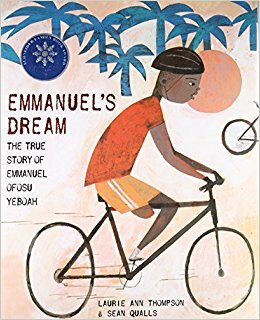 Emmanuel's Dream: The True Story of Emmanuel Ofosu Yeboah written by Laurie Ann Thompson and illustrated by Sean Quails (2015) Random House; New York. Grades K-2. SUMMARY: Emmanuel is born in Ghana, West Africa with a deformed leg. Most people think he won’t amount to much, but his mother encourages him to believe in himself and follow his dreams. He hops to school on his good leg two miles each way and learns to play soccer with his classmates. When his mother becomes ill, he leaves home for the city at the tender age of thirteen to earn money to support her. He later becomes a cyclist and rides four hundred miles across Ghana to promote awareness about people with disabilities. The film version, Emmanuel’s Gift, is narrated by Oprah Winfrey. Thank You, Mr. Falker written and illustrated by Patricia Polacco (1998). Philomel Books; New York. Ages 5-8. Grades K-3. 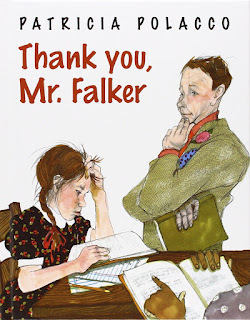 SUMMARY: Patricia Polacco, renowned illustrator and children’s book author, tells of her personal experiences with dyslexia and how one caring teacher helped her overcome bullying and learn how to read. Video interviews with Polacco talking about the book and her experiences with dyslexia may be found at Reading Rockets. Sadako and the Thousand Paper Cranes by Eleanor Coerr (1977) Puffin: New York: Ages 4-8 for the picture book and Grades 2-6 for the chapter book. This title is available as both a short chapter book (ISBN 0-14-240113-7) and a picture book (ISBN 0-698-11588-0). SUMMARY: Sadako develops leukemia as a result of radiation exposure during WWII. 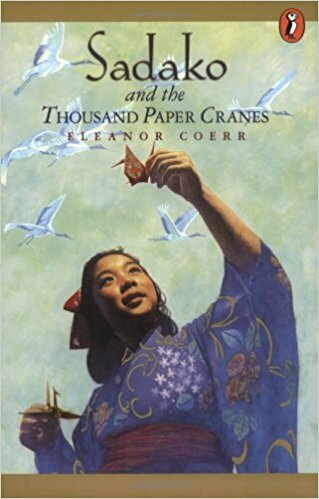 She sets a goal of making 1,000 origami paper cranes because of the belief in Japan that if a person completes this task their wish will come true. She wishes not only for health, but also for peace. Her classmates help her complete the cranes and also raise money to build a memorial. Though she dies at the age of 12, Sadako is immortalized by this beautiful story as well as a statue of her image holding a golden crane at the Hiroshima Peace Memorial in Japan. Most of the paper cranes were buried with Sadako, but her brother donated one of the few that remain to the WTC Visitor Center in New York See the article. More information about Sadako as well as lesson plans and a teacher's guide for the book may be found at the Origami Resource Center.